Historian Beschloss (The Conquerors, 2002, etc.) 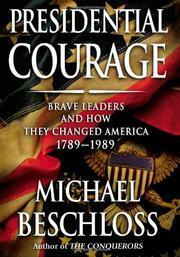 pens a vivid account of how nine U.S. presidents withstood political firestorms. Inevitably, his lively narrative will be compared to John F. Kennedy’s homage to Senate bravery, Profiles in Courage. But Beschloss views his subjects not as saints but as “worried, self-protective politicians” not above vacillation, arrogance and evasion as they steered between national and electoral interests. Recent presidents have not been the only ones who required sentence-parsing. FDR justified breaking his promise, “your boys are not going to be sent into any foreign wars,” by claiming a loophole: It did not apply in case of attack. A few of these figures relished political combat; Theodore Roosevelt aptly styled himself a “rough-and-tumble man.” Most, however, abhorred their struggles. Convinced that he would lose his bid for a second term, Abraham Lincoln wrote a private memo pledging cooperation with opponent George McClellan to save the Union between the election and the next inauguration. All of the chief executives profiled here subscribed to John Adams’s belief that a president must incur “people’s displeasure sometimes, or he will never do them any good in the long run.” Some found strength in the examples of heroic predecessors, others in their wives, all in some manner of religious belief. Beschloss recognizes that even the best policy choices come freighted with mixed motives and adverse consequences. In particular, he appraises Andrew Jackson with exquisite balance, noting that Old Hickory’s assault on the Second National Bank destroyed a corrupting political influence but also “peddled the dubious notion that America did not need a central bank,” leaving Americans to suffer 80 years of boom-and-bust before the Federal Reserve was established. Readers might question some episodes chosen, but it’s impossible to fault Beschloss’s engrossing characterizations, marvelous scene-setting and judicious assessments. History written with subtlety, verve and an almost novelistic appreciation for the complexities of human nature and presidential politics.